FLU Vaccines - Call for information. Call today to set up an appointment for your Shingrix (Shingles) vaccine. We have a Pill Drop Box at our location now. 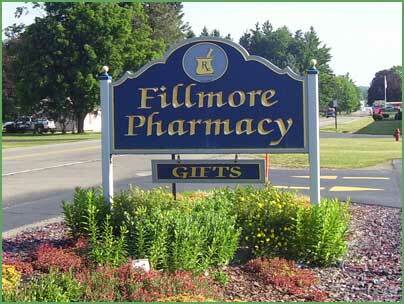 The Fillmore Pharmacy is located on Rte. 19 just south of Fillmore. We are a locally owned Health Mart Pharmacy. We are a short drive from Letchworth State Park, Rushford Lake, and Houghton College. We are a full service pharmacy that accepts most major insurance plans. We offer a private consultation area and free blood pressure monitoring. We offer a full line of OTC medicines, Nature's Bounty Vitamins, and many DME items to help keep you and your family healthy and happy. Watch for our monthly in store flyers that offer many great seasonal buys. We have a Kodak Kiosk for printing your digital photos. You can also make a CD, enlargements or copies of picture prints. We have a full gift shop "The Gift Garden" located within the store, with many ideas to select from for your gift buying needs.